The homeowners were able to create sections of space without the need for using walls. The first step in this kitchen remodel journey was to redesign the room, turning a closed-off dining space into a more open area. After that, there was a wish-list to include. Omoto says the challenge is often fitting a client’s wants and needs into the space provided. “Something like this, it’s always do you have the room to do it?” In this case, Omoto found a way by using a peninsula between the two rooms as a place not only for meal preparation but also for connecting with guests. The counter-height buffet and higher seating puts guests at eye level with the cook, helping to facilitate conversation. The center island also became a space-saver, with seating for everyone in the kitchen. In addition, it’s an eye-catching focal point, with darker cabinets contrasting with white cabinets around the kitchen’s perimeter, all by Diamond from MasterBrand Cabinets. According to Omoto, the look has been gaining in popularity with kitchen remodels lately. “They went with a two-tone, where we have a darker island that creates focus.” The quartz countertops by Viatera are also in two contrasting colors, adding a vibrant look to the kitchen remodel. The eye-catching hood also acts as another focal point to help break up the wide spaces. The room’s lighting is both practical and pretty, designed to work with the high ceiling. Omoto explains, “In a vaulted ceiling, one way for us to break that up is to do a track system where you can bring the lights down.” Individual lights can be moved and better directed to where more light is needed. Two-tone quartz countertops complemented two-tone cabinetry to add vibrancy and color. 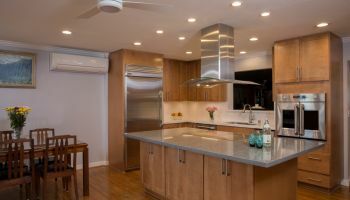 The kitchen remodel also needed to feature all built-in, high-end appliances: refrigerator, oven and microwave, all by Thermador and a decorative hood over the cook-top. “The hood actually creates a focal point, too, in the kitchen. It helps break up the spaces,” says Omoto. All the appliances are high-end built-ins from Thermador: refrigerator, oven and microwave. 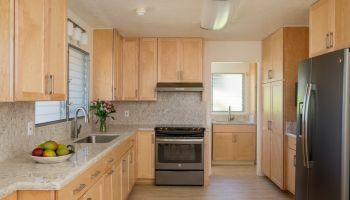 To see more projects by Homeowners Design Center or to find out how they can help you with your kitchen remodel, click anywhere you see their name or on the photos above.